Modes. Erudite jazzers swear by them and can bend your ear for hours about why the Mixolydian b6 fifth mode of the C ascending melodic minor scale will cure all that ails your improvisations. 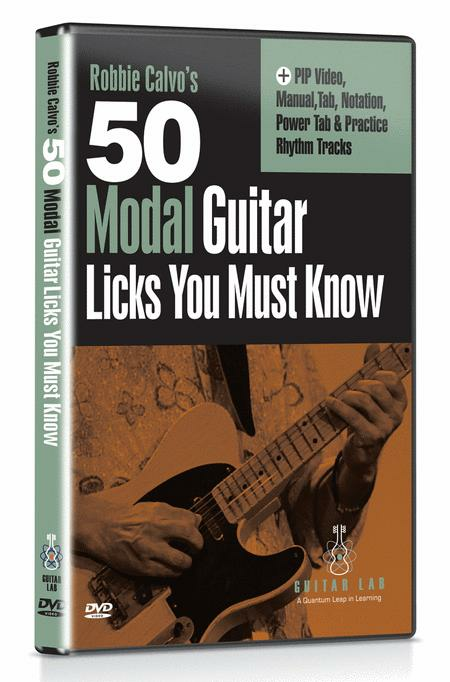 Bluesmen and rockers would likely pronounce that they "don't need no stinkin' modes." Granted, there's a vast range of opinions related to the use of modes but everyone seems to agree with two things; 1) If you play any form of Western music, you're playing modes whether you know it or not; 2) With just a little modal know-how, you can achieve big breakthroughs in your understanding of harmony and ability to improvise over chord changes. Robbie will step you through all seven modes. 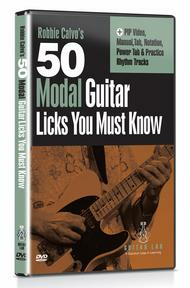 Each mode features two progressions, two rhythm tracks and seven modal licks. Robbie will first dissect the progressions to help you learn how to identify the tonal centers. He will then perform the modal line over the track and then break it down for you note-by-note, resolution point-by-resolution point. Along the way, you'll learn how to craft motifs, develop your musicality, create compelling melodies, work with triads and even how to superimpose modes for dramatic effect. Robbie Calvo studied the art of decorative painting and design at the Hastings College of Arts and Technology receiving distinctions from the City & Guilds of London, England. Robbie also graduated from the Guitar Institute of Technology in Los Angeles. Robbie has taught guitar at the London Musicians Institute and in 1995 Robbie placed second in the 'Guitarist Of The Year' finals at London's Wembley Arena. He also took first place in the Unisong international songwriting competition with his instrumental piece 'Dark Horses'. Robbie relocated to Nashville, TN in 1998, to pursue his songwriting career, writing and pitching songs by day from his 16th Avenue publishing office and playing live at the writers rounds by night. Guitar Lab's innovative learning systems employ a hands-on approach where students "play" their way through the curriculum using learning tools such as PIP video, practice rhythm tracks, and interactive tab and notation, which allows the student to play along with the tab and notation, at any tempo, without change in pitch. Secure PIN enclosed for quick and easy download of learning tools.